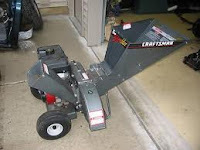 Today I travelled to Syracuse to pick up a chopper-shredder I purchased from my geezer friend Paul Beyer. He spent many years as a diesel engine technician as well an diesel engine manufacturer's representative for Detroit Diesel and other diesel engine manufacturers. I was fortunate to get a good deal on the shredder and he has always been meticulous about caring for machinery. His hobbies include building crystal set radios as well as restoring and maintaining his classic DeSoto sedan. I saw the DeSoto today in all it's shiny glory, ready to be displayed at an auto show or taken for a drive. Not only was it a pleasure to see Paul and to obtain the shredder but we also had a pleasant 45 minutes of coffee, cake and story telling. He had numerous stories to relate about diesel engine repairs under the most difficult circumstances. Especially difficult repairs were engines installed in boats where the spaces around the engines below deck are very cramped. When these boats are built the engines are dropped in first and the the deck is built on top with no expectation of lifting the engines out again. He also told me that before he retired he was the supplier of diesel engines to his friend who owned Mid-Lakes Navigation. And last Friday he and his wife Elaine celebrated their 49th wedding anniversary with a dinner cruise on Skaneateles Lake on one of the boats driven by diesel engines his supplier had installed. I had a few of my own stories to pass on regarding my repair and engine experiences just to balance the conversation. When I got home my wife asked me who I heard about among our friends during my visit. When I thought about it I said, "Nothing about people, we just talked about engines." Yes, men are from Mars and women are from Venus. Good news. Looks like the problem is solved.